As our website gets many visitors from the MENA region (Middle East and North Africa) we decided to write a post and share more details about SAP certification in Middle East and North Africa. We are going to discuss the prerequisites for SAP certification that are specific to the MENA region. Also, we will cover the details about registering for SAP certification that are relevant for the MENA market. Finally, we will conclude with pointing out several important points about the whole procedure. First of all, we should mention that SAP MENA has stopped holding certification exams from 2013 onwards. They are now only providing Pearson Vue vouchers for you to take the exam at your convenience. These vouchers can only be used within the MENA region (UAE, Qatar, KSA, Egypt, Oman, Bahrain, Kuwait). Pearson Vue is a SAP Certified Testing Center that holds certification exams. For more information on Pearson Vue, please click on the following website link: http://www.pearsonvue.com/sap/. Note: Without fulfillment of the above stated requirements (any one of them), the voucher will not be issued. However, if you still want a voucher to be issued to you, you would first have to purchase an SAP course, after which you can take the certification. SAP only provides Pearson Vue vouchers to the individuals taking the exam, or companies sponsoring their employees to take the exam. To get a Pearson Vue voucher, you need to follow three steps described below. An example of the application form is attached at the bottom of this post. Please do NOT use the attached form for preparing your application because it may be outdated. You need to contact SAP MENA and request the current application form (their email is Education.MENA@sap.com). Please fill in the application form and make sure you write all your information accurately. Most importantly, mention the exam code. You can get the information on the correct exam code from the following link. Lastly, do not forget to provide your signature, once you have filled in the form. Note: If you already have an S-User ID, kindly provide that to SAP MENA. They need it to maintain your correct record in their system. (The S-User ID is for the person who is taking the exam.) In case you do not have an S-User ID (and you have a MENA Nationality/MENA Residence visa/MENA Business visa), please let SAP MENA know. They will create an S-User ID for you after your payment is received and your application is processed. After you receive your S-User ID, you will need to register it with the testing centers. Please also have a look at our tutorial about getting S-User ID. S-User ID is different from SAP-ID. SAP-ID is created upon creation of Pearson Vue Account. Please refer to the Pearson Vue website for more details. Scan the first page (identification page) of your passport, as well as the visa page and send them to SAP MENA. Please note that the scan must be clear, and all the letters must be legible. Please make the payment by doing a bank deposit or a bank transfer to any of the bank accounts belonging to SAP MENA. You should contact SAP MENA and request the information about the details of their accounts (their email is Education.MENA@sap.com). Ensure that you reference the deposit with your name in order to match the payment with your application. If you are not paying from your account, please provide the complete name of the account holder, for SAP MENA to confirm the payment. While making the payment, make sure your IBAN number is mentioned, otherwise your payment will not be credited to the account of SAP MENA, and will be rejected. Please note that there are bank charges for each transaction. So make sure you are depositing the right amount, as the bank may deduct the fee from the money you have paid in and SAP MENA will not provide the voucher unless they receive the full amount. SAP MENA does not accept cash or credit card. Please refer to the page with the information about the cost of SAP certification for getting an idea of how much the price is going to be. Beware that the prices published on that page are for informational purposes only. You need to contact SAP MENA for getting the actual information about the price. 2. You need to contact Pearson Vue testing centers directly to check the schedule and exam availability. On their website, you can find all collection of exams, schedules and testing centers. 3. Voucher is valid for three (3) months only. You need to utilize the voucher within 3 months upon receiving it. However, the exam can be booked even after 3 months depending on the testing centers’ availability. 4. Please do not make any plans or commitments regarding your certification exam until you receive the voucher. 5. Please note that once SAP MENA has issued the voucher, THEY WILL NOT GIVE YOU A REFUND. 6. Also note, all certificates will be sent directly from SAP Germany to the address in your Pearson Vue profile. Make sure that your address is complete and correct in order to avoid any delay or loss in certificate delivery. 7. The certificate delivery time is 6-8 weeks after the exam date. In conclusion, we want to make it crystal clear that we are not associated with SAP and do not represent them. 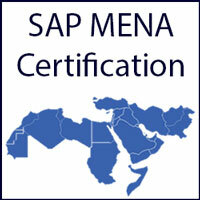 For all you queries about SAP certification in Middle East and North Africa please contact SAP MENA directly. Please do not send emails to us. We are ERP Certifications and not SAP. If you have some additional information about SAP certification in the MENA region please share it with us and other readers of our website using the comments section below. Example of the enrollment form for SAP Certification: SAP Certification Enrollment Form. I want to know is the SAP training/certification program is conducted in Pakistan; if yes when and where? Your can get SAP training in Pakistan at Abacus, Siemens, Excellence Delivery. The last one seems to be cheaper than the others. I want to know is the SAP training/certification program is conducted in UAE; if yes when and where? I am from Pakistan and want to appear in exam for Material Management – SAP in dubai on experience based, having 5 years experience. I want to know is the SAP training/certification program about Procurement is conducted in Riyadh; if yes when and where? I have 11 years of experience in Procurement and belong to Pakistan. Is Sap hcm training/certification program available in Lebanon? i need to know if there is any institute that offers SAP MM certification program in Oman . I have experience in LSCM . Please help me to know i can manage my certification course here . Hey, I am a saudi resident and just completed my bachelors in Accounting from Pakistan. Am I eligible to appear for SAP certification for Financial Accounting Module in Riyadh? Please guide me. If you have a valid national identity then can you attempt SAP certification directly. I have taken the sap certification for MM module from the authorized sap partner institute Times pro Pune India but after that I did not applied for exam because mean while I got the job in Saudi Arabia & I joined the same. Am I able to apply for the sap certification exam in Saudi Arabia,If yes then what is the procedure.